Deadly Reunions Description: Magneto destroys a chemical plant in order to attract Professor X. Cyclops, Rogue, Storm, and Professor X proceed to the chemical plant, while Jubilee is left to guard Sabretooth. Professor X enters the chemical plant to confront Magneto. Just as Magneto appears to beat Professor X, Professor X telepathically forces Magneto to recall his younger years. 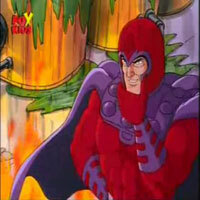 Magneto retreats in panic. Back at the X-Mansion Sabretooth growls in disgust and complains about his wrist bindings. 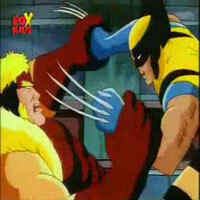 Jubilee loosens the restraints, and Sabretooth captures Jubilee, but, Wolverine leaps from the shadows and attacks him. 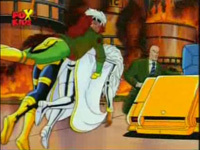 Their battle is interrupted with the return of Professor X and the other X-Men. This distraction provides Sabretooth an opportunity for escape, slashing deep wounds in Wolverine\\\\\\\\\\\\\\\'s chest. Page rendered in 0.266 seconds.